The chain broke the second time I wore it. 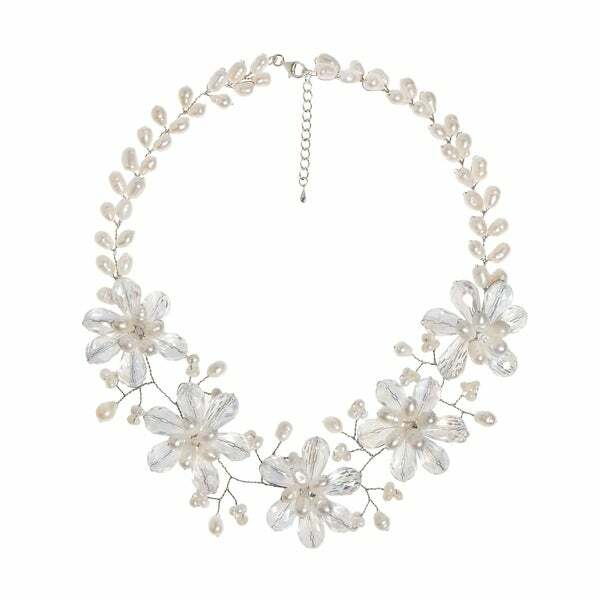 Silver Tone Y Neck Necklace (46mm), Flower Shaped Genuine Black, Mother of Pearl, 18"
Freshwater pearls and crystal accents form a sophisticated floral design. Crafted by hand, this necklace makes an elegant statement. Lai was exposed to the craft of jewelry making at a very early age. Lai began making and designing jewelry of her own at an early age. By 14, Lai's aptitude and skill had blossomed and she was able to turn her jewelry making talent into a business for her family. Her enchanting floral designs are derived from the natural colors and stone materials found abundantly in Thailand.Her warm personality, creativity, and hard-work have helped her business grow. All weights and measurements are approximate and may vary slightly from the listed information. Treatment code N (freshwater pearl CR (crystal). See Treatment Guide for further information. Wow... very nice item and quite pretty! The pearls are big and well matched in size and color. I love it! This is really beautiful and the colors in person are the same as the website. The problem I have with it and the reason why I gave it only 3 stars is it has wire to hold it all together & it's nearly impossible to get it to sit flat on your neck so it buckles for lack of a better term. It is breaks easily. I would say it is better suited for an adult than a teen or child. quite pretty, but not an item to wear every day......looks great for fancy dress-up. Did serve its purpose with wedding attire. I wanted this style necklace for a dressy event in April. "Do you sell matching earrings? I only buy a necklace if I can buy earrings that match it." We do offer something very similar to this necklace. Please click one the following link: http://www.overstock.com/Worldstock-Fair-Trade/Sterling-Silver-Dreamy-Nature-Pearl-Earrings-Thailand/5099224/product.html.